Compare Mobile Phone Size: Is Your Next Smartphone Too Big? Will your next smartphone be too big? This interactive guide shows you a side-by-side comparison of mobile phone sizes. Smartphones seem to be increasing in size all of the time. 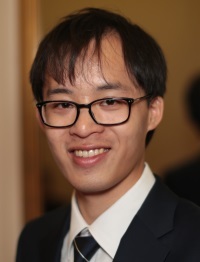 The latest generation of high-end smartphones have grown to encompass 5-inch displays at full HD resolution (this includes the Samsung Galaxy S4 and the Sony Xperia Z). Whilst bigger displays are great for browsing the web and using apps, it can sometimes be unwieldy to use a bigger phone for calling. An oversized phone can also be awkward to carry in a pocket. With this interactive guide, we compare the size of different smartphones. Using the list below, select the devices that you’d like to compare the size of. We’ll show you all of the devices side-by-side and to scale. For an indication of the real-world size, select the “Show Full Size” option. 2 What is the right size for a smartphone? 3 What is the resolution of a display? 4 What does pixel density (ppi) mean? Using the list on the left, choose the smartphones that you'd like to compare the size of. What is the right size for a smartphone? The “right” size for a smartphone is a matter of personal preference. Better Multimedia Experience. Bigger smartphones normally give a better multimedia experience. This is because they have bigger displays at a higher resolution (more pixels). With a bigger display, there’s more room for all of your content: that includes apps, videos, games and webpages. Longer Battery Life. The battery takes up much of the volume inside a typical smartphone. Because there’s more space available, larger smartphones tend to pack bigger batteries. This means they can give longer battery life. Easier To Type. A bigger display means more room for the on-screen keyboard. With bigger buttons on the keyboard, it can be easier to type on a large phone. Possibility of Multi-Tasking. Some phones allow you to run two applications at a time (e.g. side-by-side multitasking on the Galaxy S4 & Galaxy Note II). This works better on a larger display. Less portable. It can sometimes be unwieldy to make phone calls on a phone that’s too big. Your phone will also be less portable and less pocketable. Difficult to use with one hand. With bigger phones, it can sometimes be difficult to reach a far corner of the display. You may prefer to use two hands instead: this reduces the likelihood of your phone being dropped. Having a better grip on your smartphone will also deter phone snatchers in public places. 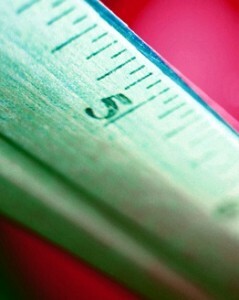 How To Measure Display Size. On most smartphones, you’ll find a screen that measures 3.5 to 5-inches along the diagonal. Note that the screen area will scale with the square of the diagonal length i.e. a 5-inch display actually has double the screen area of a 3.5-inch display. 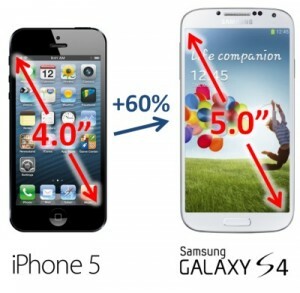 Apple uses a 4-inch display on the iPhone 5 whereas Samsung uses a 5-inch display on the Galaxy S4. When comparing screen area, the Galaxy S4’s display is 60% larger. To get an idea of real-world phone size, try selecting the “Show Full Size” option when comparing phones above. What is the resolution of a display? The display on a smartphone is made up of many “picture elements” (pixels for short). Each pixel is formed from a group of red, green and blue subpixels. The display is able to vary the brightness of each red, green and blue subpixel. By varying the brightness in an appropriate way, colours can be formed. With enough pixels, it’s possible to form an image on the display. The resolution of a display simply refers to the number of pixels. The higher the resolution of the display, the more detail you’ll be able to see. On high-end smartphones, you’ll typically find a “High Definition” 720p display (1280×720 pixels) or a “Full HD” 1080p display (1920×1080 pixels). Mid-range smartphones will have a typical resolution of 800×480 pixels. On an entry-level smartphone, the resolution of the display is likely to be even lower. This can cause “blockiness” and lack of detail on the image. 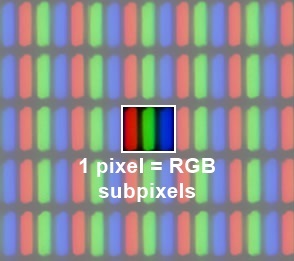 A pixel is made up of red, green and blue subpixels. What does pixel density (ppi) mean? Pixel density refers to how closely individual pixels are spaced. It’s typically measured in “pixels per inch” (ppi for short) where a higher ppi means sharper and clearer images. The iPhone 5 has a 326ppi “Retina” display. This has long been held up as the “gold standard” for displays: Apple claims that it’s fairly close to the limits of what humans can observe. At typical viewing distances, you shouldn’t be able to see individual pixels on a Retina display. Although the iPhone 5 has a great display, it’s recently been outclassed by many other devices that have a higher pixel density. Samsung’s Galaxy S4 has a 441ppi display. The HTC One has a 469ppi display whereas the Sony Xperia Z has a 441ppi display. It’s argued that someone with perfect vision can see details up to 720ppi when holding their smartphone at a distance of 30cm. 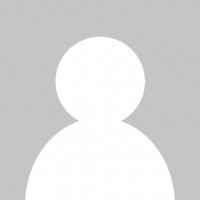 Cannot find jitterbug smartphone (by GreatCall) among your comparison data. I bought one of these and can’t find a case,wallet or pouch to fit (size 6 x 3.125). Size does matter if u have small hands and bifpg size is to hard to hold. I still have an Alcatel 222 clamshell phone with a screen size of around 3.5 cm. It’s probably the smallest phone made in recent years. I think large phones could sometimes be a way of saying ‘look what I’ve got’, a bit like the brick mobile phones of the 1980s. Over time they got smaller and smaller, until smart phones came along. But as large screen phones are more commonplace now the fashion statement aspect does not have the impact it had a few years ago, because most people have them. But at least it is still possible to buy small phones.